Sewing is a great expertise, if you know sewing you can make your free time valuable. We all are acquainted sewing is not that easy to execute. But, it is so important and beneficial if you know sewing. Again, it is a very lengthy process to learn sewing. Despite of that if you heartily want to learn sewing and make your free time worthy, then you are at the right place. Because, we are going to review a sewing machine which is a perfect choice for the beginners. And after knowing about the machine and using it, you will be able to easily sew your favorite clothes and design many crafts like a professional tailor. The review will be about the ‘singer 7258’ sewing machine. It is a very popular sewing machine within an affordable budget. This sewing machine comes with 100 built-in stitches. Among the 100 stitches, you will get 76 decorative stitches, 8 stretch, 7 buttonholes and 9 essential stitches. It can be easily tensioned with the help of ‘automatic tension’ switch. It has a speed adjustment switch by using this you can easily control your sewing speed. It comes with a jam resilient bobbin system and automatic bobbin winding system. Has an accessory storage on the free arm storage area, that is how you can easily access all the needed stuff. There is an automatic reverse switch to sew stitches in reverse. It comes with a foot pedal, which will definitely come in handy while you want to speed up or down manually. You can easily change the needle position to 13 different positions for convenient sewing. It comes with 10 pressure feet, which are very beneficial in situations. Has start/stop switch to easily turn the sewing machine on or off and. Comes with an LED screen which will show you the details about the stitches. Comes with the Automatic needle threader feature. Its internal body is built with a metal frame, so it will jump out during sewing any heavy clothes. It has 7, 1 step automatic buttonholes and a bright lead light to give you an advantage for working in low light. As this product comes with many features preloaded, it is needless to say that this product has many benefits. The main advantage of this product is that it will give a quality performance comparing with its amazing low price. It is very easy to use. 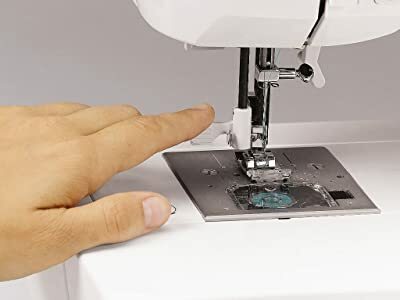 So, whether you are a beginner or a professional, you can easily cope up with this sewing machine. This machine is also very good for heavy working as this machine is built in with a metal frame inside. So, you can easily sew jeans and with its many types of stitches, you will be able to stitch many gorgeous designs for you and your friends and family. There are more additional benefits of using this machine, you can get more idea about those from the previous part of this article. Singer 7258 Stylist Award is equipped with 100 beautiful stitches, 10 different pressing feet for crafting, quilting and sewing functions. With such amazing number of stitches, this machine also has an automatic needle threader feature for easy and instant use. Users can benefit from the simple LED display control panel that has an indicator for automatic stitch length and width. Bobbin winding is made super-easy with an upper- drop-in bobbin technique that also has a transparent cover for users to monitor. For prolific sewers electronic auto pilot provides an easy way out of sewing without peddling. They can also control the speed of sewing. With a proper set of needles and good thread, this machine can even sew denims and other heavy fabrics. It is noiseless and smooth in its operation. Hence, we recommend this machine to people who sew a lot and even to beginners as it is easy to set up and use. Singer 7258 Stylist Award sewing machine is available only for buyers from United States and Canada as it is designed for 110 volt power use. Buyers from above mentioned countries can purchase it on Amazon. Singer 7258 Stylist Award sewing machine comes with a detailed manual and an instructional DVD that explains how to set up the sewing machine. Even a beginner can start working right away with the help of these guiding tools. Parts and labour for purchase of this machine has manufacturer’s warranty for 1 year. An authorised Singer service centre can undertake all the repairs. Customers should retain the purchase receipt to avail services. For repairs after warranty customers need to pay for the services. In order to maintain the machine users can follow the trouble shooting techniques from the manual. To choose a perfect sewing machine for you from the great number of sewing machines in the market is not an easy task. But, if you want a good quality sewing machine within an affordable price, then singer 7258 stylist can be a precise choice. This sewing machine has so many features that will surely help you to enrich your skill in sewing. So, you can undoubtedly go for this particular sewing machine.